The 1984 presidential election was the pinnacle of the Reagan Revolution. On his way to re-election, the incumbent President Ronald Reagan carried forty-nine states (Walter Mondale eked out a win in his home state of Minnesota) and won a record 525 electoral votes. By the time all the votes were counted, Reagan took 58.77% against Mondale’s 40.56%. In 2012, President Barack Obama won took twenty-six states on his way to a 332 to 206 electoral college victory over Mitt Romney. Obama received 51.06% of the popular vote to Romney’s 47.2%. Despite Pres. Obama’s success, by any measure his re-election pales in comparison to Reagan’s. The New York Times’ Nate Cohn recently created a county-by-county map to chart the changes between the 1984 and 2012 presidential elections. Given the fact that 1984 represented the GOP’s peak performance, you would expect to see a rather static map that shows modest Democratic gains across the nation. Instead, however, one discovers that a completely different electoral environment took shape in those intervening twenty-eight years. The Democrats have drastically improved in New England and the Southwest while Republicans are running much stronger in places like Texas and Appalachia. This graphic is also the best representation of a case I’ve made several times over the last few months. Namely, that Pennsylvania is an unique state because the western half is becoming more Republican as the eastern half is growing more Democratic. Looking over the map, there is no other state so evenly divided in two. The Appalachia sections in the west are significantly redder, with the lone holdout in Pittsburgh’s Allegheny County. Meanwhile, the Acela corridor in the east has become blue. The collar counties around Philadelphia hold the most votes but the deep blue from New England has spread from NEPA to the South Central section of the commonwealth. Altogether, it’s another informative illustration of the shifting trends in Pennsylvania’s (and America’s) political landscape. Two elections representing a 21 point swing and you only expect ‘static’ changes? A lot of the people who voted in 1984 aren’t even alive today. Even exploring the changes between 2008 and 2012 would be more relevant and helpful. Misleading map. Ofc most counties have shifted Democrat since 1984 because 1984 was one of the biggest landslides in electoral history. A better comparison would be 1968 (when the GOP started to court the South) or 1988/2000, maybe? 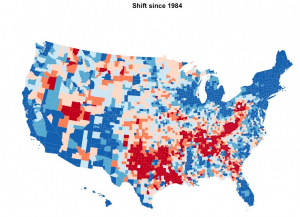 From the looks of that map, Republicans have the deep south, Texas and Appalachia. Outside of that, there isn’t much deep red. How do they hold Congress?